The skûtsje is the classic boat of Friesland. Its design evolved from the larger tjalk in the mid-1800s to satisfy a need for sturdy, flat-bottomed boats that could sail the shallow waters of the Zuiderzee and also enable navigation inland through the narrow canals and bridge cuts to the Friesian towns, villages and farms. Among their early uses was hauling peat from inland Friesland to markets across the Zuiderzee in North Holland. On their return trips they dried-out on low tides and loaded sand to replace the harvested peat so that the areas would remain above sea level. Skûtsjes were initially built of wood; however, as early as 1889 skûtsjes began being built of riveted iron and during the first decade of the twentieth century, steel replaced iron as the preferred material. From about 1910 the skûtsje dominated the market for fast transportation and regular schedules. There were 870 iron and steel skûtsjes built over four decades. The length of the classic skûtsje varies from about 12 to 20 metres, its beam is generally less than 4 metres, mostly 3.3 to 3.6 metres and its hold is 1 to 1.25 metres deep. Large fan-shaped leeboards are fitted and the skûtsje flies two sails, a gaff-rigged mainsail with a gracefully curved gaff, and filling the foretriangle, a self-tacking jib. The jib's clew travels on a luiwagen, a transverse sheet block rail, while its tack is attached to the outboard end of an iron loefijzer, a bowsprit about a metre long. The bows and sterns are low to allow easy passage under the bridges. In 2009, after an analysis of the most competitive racing skûtsjes, the specifications of optimal skûtsje were published. 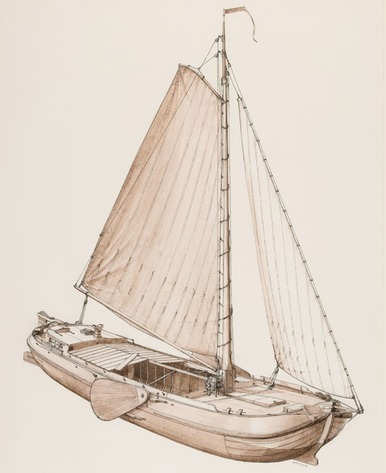 The mast is 105% of the length of the barge, the foot of the mainsail is 50% of the barge length, the gaff is 100% of the beam of the barge and the rudder length is 50% of the barge's beam, and with its skeg, it extends 30 centimetres below the barge's bottom. The classic skûtsje typically has a low roef, the living quarters cabin in the stern, with just sufficient clearance aft of it to allow the swing of the steering tiller. Forward of the roef is the cargo hold, which is covered with removable luiken, or shutters. Standing at the forepart of the hold is the tabernacle which supports the mast. When navigating canals, the skipper of a skûtsje would need to drop and raise the mast frequently to pass under the many low bridges. To enable this, the mast is designed with a counter weight slightly heavier than that of the mast and rig above the pivot point. There is a slot in the foredeck, called the mastluik, which allows the bottom of the mast with its counterweight to swing up and down. It is a wonderful sight to watch a skûtsje approaching a bridge with its mast and sails up. At the last moment, the skipper pulls on the topping lift, the mast swings down, the boat glides under the bridge, the topping lift is released, the mast swings back up and the skûtsje sails on.